EQUIPPED TO HANDLE ANYTHING — EMBRACE PAVED ROADS, PATHS AND DIRT TRAILS WITH CONFIDENCE AND STYLE. Designed to bring the best of both road and mountain worlds together. 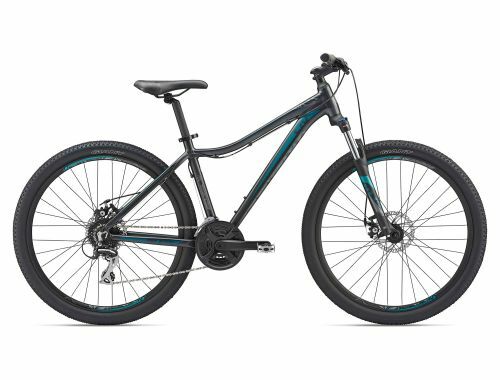 Bliss delivers front suspension, on a 27.5-inch wheel size for stability with great traction from wider tires, and a relaxed style that keeps you more upright and comfortable in the saddle, while offering 26-inch wheels in smaller sizes. The road inspiration offers a lightweight design and pedaling efficiency. Integrated dropouts allow you to install a rack or add a kickstand to transform the bike into capable commuter or weekend adventurer. Bliss 26 is available in both V-brake or disc brake versions. With Liv’s Purpose Driven Design, relaxed style and lightweight ALUXX frame, Bliss is ideal for city roads or around town trails. The LivRight Sizing Philosophy ensures the best fit for women for a truly comfortable ride. A front suspension fork, 27.5-inch wheel size, and disc brake option make for the perfect balance of capability and ease. It could be your first time putting rubber to dirt or heading out in the neighborhood for a light pedal — an introduction to the freedom of cycling shouldn’t equal a huge investment. A relaxed style keeps you more upright and comfortable in the saddle without sacrificing efficiency. When variable weather conditions arise, braking precision and traction are combined to keep you riding smoothly. Open up the possibilities to follow the road less traveled. Вага Скільки важить цей велосипед? Досить важливе й, мабуть, найбільш часте запитання. Але правда полягає в тому, що загальної відповіді на нього не існує, тому що не існує жодного виробничого стандарту для визначення ваги велосипеда. Розмір рами, матеріал, комплектація й, навіть, спосіб фарбування безпосередньо впливають на вагу всього велосипеда. Тому ми віримо тільки в один достовірний спосіб визначення правдивої ваги велосипеда - зважити конкретний екземпляр в найближчому велосипедному магазині. Giant залишає за собою право змiнювати специфiкацiї без попереднього повiдомлення. Lightweight ALUXX aluminum is made in house with geometry to best fit the female rider. Fit | Form | Function. Liv's team of engineers uses this design philosophy to produce a bike that performs best for the female rider. Liv bikes come in a wide range of sizes to offer the best fit for every woman. 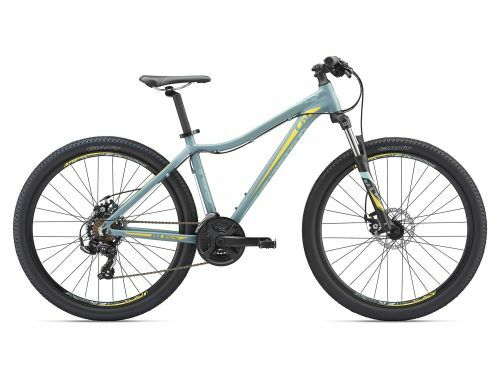 Frame is engineered with disc brake tabs and features a disc brake-specific design for more confident braking in variable weather and terrain. Featuring 27.5-inch wheels for lighter weight, greater efficiency and more control over 26 or 29-inch wheels. Compatible with racks and fenders for the easy addition of panniers, kickstand and other accessories. Інформація про розмір має виключно довідковий характер та не є максимально достовірною. Будь ласка, зверніться до Вашого уповноваженого дилера Giant та Liv для визначення правильного розміру. Q Розмір коліс 26" 26" 27.5" 26" 27.5" 27.5"
This High-Performance level, state-of-the-art aluminum material is made predominantly from 6011 alloy and delivers best-in-class strength-to-weight ratios. These framesets also feature unique welding technologies for a high-performance ride quality. Fit, Form, and Function — Liv’s data-driven approach to building bikes for women. Fit: Liv analyzes data on human body dimension, muscular strength and muscular activity, then considers the type of riding the rider will be doing, to build a frame that is fine-tuned through athlete feedback cycles with the goal to fit as many women as possible. Form: The bike’s outlook takes the form with the intention to create a strong bond between the rider and the bike. The designers match the performance level of the bike with a beautiful and inspiring outlook.